On Wednesday 5 September, after a thrilling final, Unilever Food Solutions crowned their 2018 Chef of the Year winners. 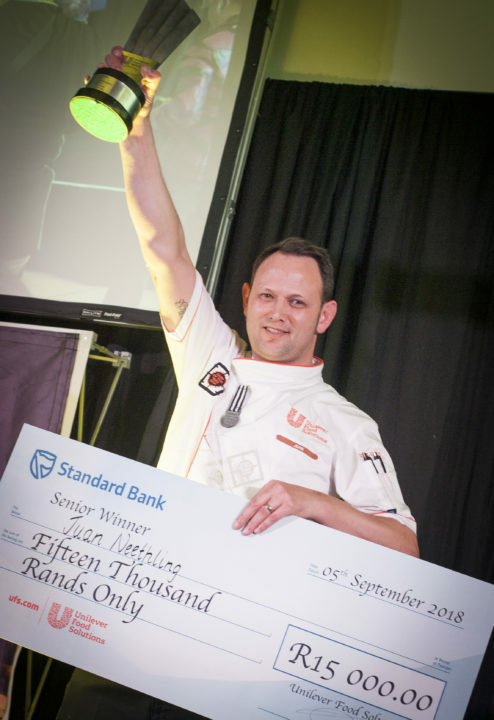 Held in five categories – Senior, Junior, Team of 4, High Tea and Rise Up – the Unilever Food Solutions Chef of the Year is the oldest culinary competition in South Africa, and in its 40 year history has provided many chefs with the recognition they need to take their careers to the next level. This year saw Juan Neethling from Southern Sun Waterfront (Cape Town) winning the Senior category while Josh Utah Green from 1000 Hills Chef School (Durban) walked away with the Junior category honours. Laduma Caterers (Cape Town) won the Team of 4 category, Team Oyster Box (Durban) the High Tea category, while finally, Tapiwa Munyawiri (Johannesburg) won the Rise Up category. Head Judge Tony Kocke was impressed with what he saw. “My philosophy is cook with passion or not at all,” he said. That’s why today was such a good one – these young chefs cooked with huge passion, and it came through in the food they produced. It’s exciting to see the creativity, passion and work ethic displayed here today. It’s chefs like these who will evolve the culinary landscape in South Africa,” he said. The Senior and Junior categories were closely fought competitions. The Senior category was open to chefs 25 years and older with a minimum of 5 years’ experience, while the Junior category comprised chefs aged 18 – 25 years, with less than 5 years’ experience. Contestants in both categories were required to prepare a three-course menu to serve three judges using the produce from a vast communal table, filled with premium quality fish, meat, and seasonal fruit and vegetables. Each finalist was expected to use a minimum of 10 compulsory Unilever Food Solutions products. Although the dishes of all 6 finalists were exceptional in the Senior category, it was Juan Neethling’s starter of seared tuna, main of grilled ostrich fillet and dessert of passion fruit parfait that came out tops. “I can’t believe it,” said Neethling, who walked away with R15 000 in prize money. 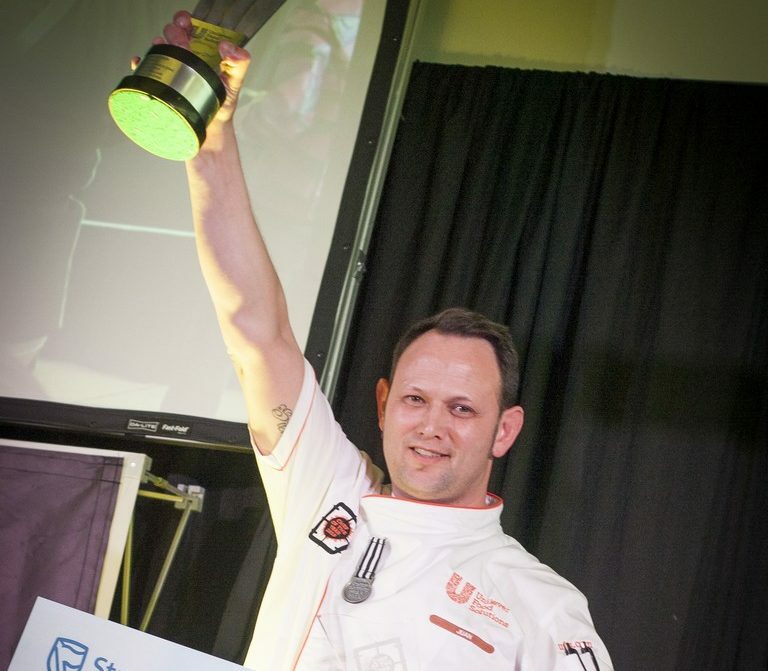 “I am so happy to represent my company, and to win this for Cape Town! I think I won because I followed my heart. Everyone gives advice on what you should do, but I stuck to my plan. I did me, and I think that’s what got me across the line,” he said. The Junior category clearly showcased the deep well of culinary talent South Africa has to offer. Although all 6 finalists created fine dishes, it was Josh Utah Green’s starter of pan-seared salmon, main of lamb loin and chocolate fondant dessert that emerged victorious. The Team of 4 category, open to chefs from the catering industry only, aims to recognise the efforts of hard-working and skilled members of the kitchen support team, who are often not given credit for the roles they play. This category aims to shine the spotlight on teamwork, collaboration and execution at the highest level. The Team of 4 contestants were required to prepare a three-course meal for eight people. Team Laduma Cape Town’s teamwork, menu preparation and overall presentation impressed the judges enough to secure them victory and prize money of R50 000. Laduma Caterers cooked tempura prawn, poached salmon and stuffed calamari tubes with lemon marshmallows and pickled root vegetables as a starter. For mains, they cooked a pan-seared beef fillet with roasted cauliflower puree, a garlic and thyme croquette and sautéed seasonal vegetables. For dessert, they made a passion fruit mousse with a rooibos ganache brownie. For this inaugural category, Unilever Food Solutions personally selected and invited teams of two chefs to take part. Chefs needed to prepare their High Tea cuisine beforehand, pair it with teas from Unilever Food Solution’s new Pure Leaf and Lipton Exclusive Selection ranges and present to the judges. Shaylan Pillay and Kris Maslamoney from the Oyster Box Hotel (Durban) walked away with the winner’s trophy in this category. “Hard work and perseverance paid off for us. We’re dedicated – we love food. It showed in our cooking today,” said Pillay. This category shows that tea is hugely versatile and can be paired with food just like wine and whiskey traditionally would be. This is why Unilever Food Solutions decided to use a sommelier, Laurie Cooper from the KZN School of Wine, as a judge for this category. “With the ever increasing calibre of speciality teas, the interaction of tea with food is more rewarding than ever before,” said Cooper. “Including the High Tea category in this year’s competition is a dynamic and innovative approach which shows how important it is for chefs to be able to understand all areas of the overall dining experience,” she said. According to Cooper, the chefs showed an inherent understanding of flavour interaction and skilfully balanced the flavours of the tea with the food without overpowering either element. Rise Up to Your Potential! Finally, the Rise Up category was won by Tapiwa Munyawiri, who cooked a seared beef fillet with potato foam, cauliflower puree, a pistachio salsa, confit mushrooms and pomegranate jus. Rise Up is a unique category, as it comprises chefs who are trained and skilled but currently without work. This category was conceptualised while screening the entries to the 2018 competition. Craig Elliot, Executive Head Chef of Unilever Food Solutions, realised that there were many entries from qualified chefs in the industry who are unemployed. This sub-competition aims to give the winner a real kick start to success: UFS will provide the winner with a 10-month work placement, a UFS salary to subsidise the work placement and a high-quality knife set that they will need to make their mark in the culinary world. “I’ve been out of work for almost three years,” said Munyawiri, who was clearly overjoyed at the outcome. “And then Unilever Food Solutions came to my rescue,” he said. “I was depressed, but knew I had to try my hand at this competition. I am speechless, and I am so very grateful to Unilever Food Solutions for this opportunity,” he said. Excitement continued to mount when Ronald Ramsay, the Group Executive Chef of the Sun International Group, offered Munyawiri and another Johannesburg contestant, Peter Mogopodi, a permanent position. Ramsay wasn’t the only one keen to take on Rise Up contestants: Tony Kocke, the executive chef of Fairmont Zimbali Resort took on one contestant, while Russell Jordon, the Regional MD of FEDICS hired three of the contestants. Craig is proud to be involved in South Africa’s oldest culinary competition. “Unilever Food Solutions has been running the competition for over 40 years. This year was an extraordinary year that showcased a new level of talent,” he said. For Elliot and the company he represents, the Chef of the Year competition is their way of giving back to the industry. “It gives chefs the opportunity to showcase their skill and talent to the broader industry, which opens new doors for them. For many chefs, this competition has kick started their careers,” he said. Bol is pleased that the two new categories were such a success. “The High Tea category, introduced to complement the launch of two new exclusive tea ranges, brought a new dimension to the overall competition,” he said. “We were especially proud of the Rise Up Category, which makes a contribution to one of South Africa’s biggest challenges – unemployment. We are honoured to make a difference to the life of even one chef,” he concluded.